Ready to learn some nightclub dances? Rockin' Horse Dance Barn has been teaching popular nightclub dances including The Hustle and Nightclub Two Step for over 25 years! Nightclub or “Club” dancing means something different to everyone. 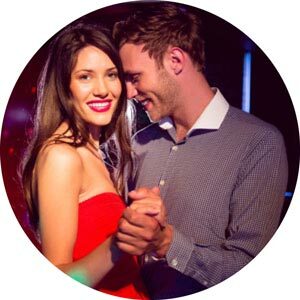 Below are the dances we consider Nightclub dances in our Nightclub Dance Classes. If you don’t find the one you are looking for check under some of the other categories. Salsa might be one of them. We put Salsa under Latin Dances. Discotheques (Disco) with high quality sound systems, and flashing lights became a popular form of entertainment in Europe and America in the late 1960’s and throughout the 70’s. In the early 1970’s a new dance craze became popular on the crowded dance floors of New York. This “Touch Disco” was called the Hustle. The Hustle marked a return to popular dances where couples danced touching each other. The popularity of modern and “retro” music with “disco” beat keeps this dance fresh, exciting and full of energy today. Does the word “Hustle” conjure images of Travolta line dancing in his bell bottom pants and famous disco pose? Well that couldn’t be further from the Hustle we dance today! It’s now a contemporary dance, always evolving and maintaining popularity. Hustle incorporates elements from several dances such as West Coast Swing, Latin dances and Ballroom arm styling. Click here for Hustle Dance Lessons, class schedules, syllabus and music sheet. This is the dance to do when a slow song is played and it’s probably one of the easiest dances you’ll ever learn! It is a romantic dance, consisting of triple-steps set to popular music. It enables couples to glide over the dance floor with simplicity and grace. Often wedding couples choose it for their first dance because it is so easy and beautiful and it goes well to the love songs of today. Click here for Nightclub Two Step Dance Lessons, class schedules, syllabus and music sheet.